Taste test: These triangular tortilla chips had pretty much a standard taco powder taste. 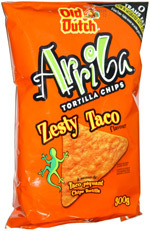 The chips toward the top of the bag generally had less flavor powder than the ones at the bottom, so "zesty" would more accurately describe the lower ones, as they had a stronger taste and even a nice hot aftertaste. 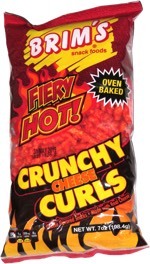 These were perfectly good chips, but nothing special, as they didn't receive much enthusiasm from our tasters. Smell test: Strong taco powder smell.